A full range of plastic containers stored at 3 sites in the UK. From the smallest part containers to the largest pallet size container. From wall bracket systems to carousel multibin systems. With over 60 varieties of bins suited to a selection of environments. We often stock Recycled containers please call to find if we have a size to suit your business. Documents are kept safe from water damage, & the high impact durablity of plastic office containers give your office manager peace of mind. Ensure important office documents are kept organised, & protected with our range of office file storage solutions. Our selection of file storage containers offer ease of use, with a portable, manageable office filing system. Vertical, or horizontal carousel multi-bin storage offer the maximum usage of space within an office, or warehouse environment. Suitable for small parts storage, documents, or office files. 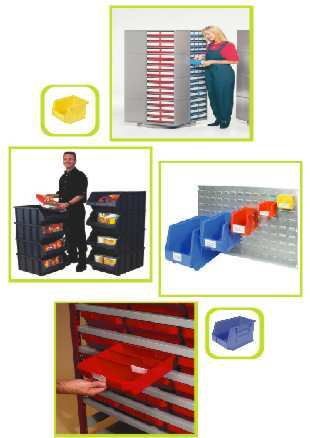 Useful for small parts storage, or using larger containers in an industrial warehouse environment. Sturdy, & resilient, our container storage bins give long lasting use for a variety of storage needs.